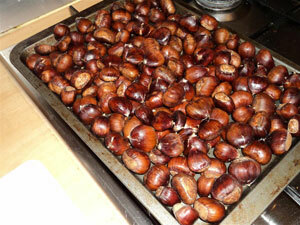 The Sweet Chestnut is not a native tree to Britain. It is thought that the tree originated in Greece but and was planted in the Britain by the Roman, who planted the tree all across their conquered empire. This is presumably for the use of the nuts that grow on the tree. 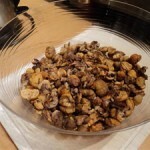 The nuts have formed an important food source for centuries where crops couldn’t be grown, and just like wheat the nuts can be ground into flour. Chestnuts are pretty unique compared to other nuts. Whilst nuts like the Hazel nut are rich in protein, the Sweet Chestnut is on the whole carbohydrate and have a floury texture. 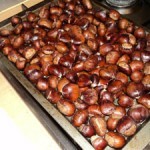 Chestnut flour is still used in rural cooking to day, and can be purchased from specialist supplies. 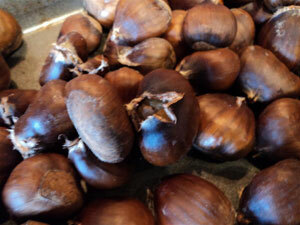 However in October, or thereabouts, you can with a bit of searching find plenty of Sweet Chestnuts to make their own flour. The process is pretty straight forward but does take a bit of effort. Let the resultant flour dry out if it still feels moist. The flour can be frozen for a few months, or use it in cooking. 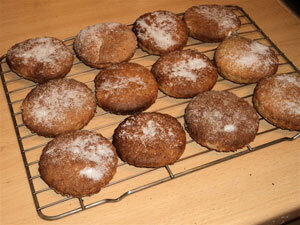 It is worth pointing out that chestnut flour has no gluten in it and thus is suitable for a gluten-free diet. 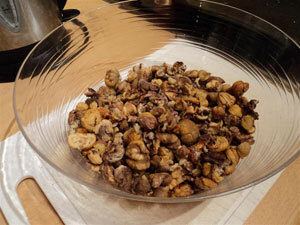 Sift together the sweet chestnut flour, flour, baking powder and salt into a bowl. Dice the butter and rub into the flour mixture with your fingers until thoroughly combined then mix in the sugar. 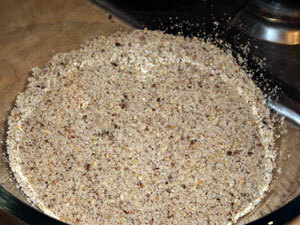 Form a well in the centre and add the milk until the mixture comes together as a dough. Turn onto a lightly-floured work surface and knead lightly before rolling out to about 6mm thick. Cut into rounds with a pastry cutter and place on a lightly-greased baking tray. Transfer to an oven pre-heated to 200°C and bake for about 15 minutes, or until golden brown and cooked through. Allow to cool on a wire rack before storing in an air-tight tin or eating. I have used this to make a very tasty moist gluten free choclate brownie, thank you! Pleased to find this recipe today. I had already made the flour, and froze it (left over nuts from Xmas) . I was dubious with the amount of Baking Powder required, (3 tbsp), I only used 3tsp.The mix resembled pizza dough and raised well during the cooking time. More like scones than biscuits. Serve with butter and jam. Don’t know how long they will store.